You can say that the whole point of a baby shower is the gifts that expecting parents receive. Not only are baby showers celebrations of the long awaited baby, they're an opportunity for friends and family to come together and help provide the parents with all those baby necessities! 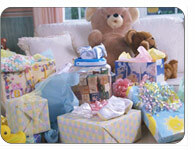 Baby shower gifts are greatly appreciated by parents, as there are so many unforeseen costs in having a baby. Remember, there are a lot of options available to you when shopping for baby shower gifts. And, because each individual gift usually focuses on only one of the individuals involved (whether it be the mother, father or baby), you can try getting a smaller gift for the others. Here are some tried and tested baby gift ideas. dads: in the past, fathers have taken the back seat at baby showers; nowadays, it's nice to show dad that he hasn't been forgotten. Good father gifts include parents guides for fathers or fun gag gifts. There are so many gift ideas out there, from unique baby shower gifts to smaller gifts that fit inside baby shower gift baskets. How does one choose the perfect gift? First, choose a gift that seems to 'fit' with the expecting couple. Second, it helps to know what options you have. Here are some tried-and-tested baby gift ideas. 1. Books: Books make great gifts for parents (see below for a details on these books), because there's so much still to learn about parenting. There are a few popular parenting books out there any expecting couple will greatly appreciate. The popular Attachment Parenting Book: A Commonsense Guide To Understanding and Nurturing Your Baby is a psychological guide to raising healthy and happy children. Parenting From The Inside Out is another great psychological guide to help prepare parents for all the days that lie ahead. A popular comprehensive guide to the first year of parenting is The Mother of all Baby Books. Another great gift idea is to order a subscription to a parenting magazine, such as Parents, Baby Talk or Parenting. These magazines offer great advice to new and seasoned parents. 2. Diaper Service: This is a very practical, popular gift and it's great gift for time-strapped parents (and all parents will be time-strapped)! One or more guests can pool money to subscribe to a diaper service. These services will drop off fresh diapers tailored to your child's age. Choose between two services: the cloth diaper service (which will also pick up the soiled diapers) and the disposable diaper service. You can choose to give a one-month's supply or get a few friends in on the gift and get a full year's supply! 3. Baby Skin Care Products: More and more retailers are getting in on the baby pampering game, which means parents (and those buying gifts for parents) now have many wonderful baby skin care products to choose from. Of course, all parents want the best for their newborns. This is why so many manufacturers are creating skin creams and soaps that are all natural; some are even organic. So, if you know that mom and dad will want to keep their baby's sensitive skin as soft and healthy as can be, consider buying some all-natural baby skin care products. 4. Baby Backpack: Know an active parent? Someone who needs to haul around a lot of baby gear but still needs to have their hands free? Sound like every parent you know? Then consider buying a baby backpack. Similar to a diaper bag, these backpacks are designed to hold everything a parent needs, including their lunch! But what makes these carriers more than just a diaper bag is that they sit comfortably on your back, not on a shoulder. Plus, some even come with an oversized diaper change pad. Whether mom is out hiking in the mountains or just hiking the city streets, a baby backpack is always a handy gift! 5. Journals : There are some truly beautiful keepsake journals on the market, such as the My Life Is An Open Book journal. Give this to moms so they can record all those precious memories. 6. Baby Bassinets: A baby bassinet is a great gift, as if can double as a baby shower gift basket. The best idea is to collect a pool of money from all the guests, and then have guests bring individual items to fill up the bassinet gift basket! 7. Baby Blankets: Know how to knit? A baby blanket is the perfect keepsake, and often remains with a child until they're older. There are many adorable patterns to choose from and knitting a baby blanket shows a real commitment in time and energy. 8. Baby Bedding: Another great idea that no new parent can get enough of is baby bedding. Go to our forum for great baby shower gift ideas.